Recently, I've noticed many people are experiencing throat chakra blockages. Whether it's because we're spending more time on social networks rather than talking in person or that, collectively, our lives aren't reflecting the fullness and truth of who we really are this increase in blockages in this vital chakra is alarming, but easily remedied. It’s not always easy to tell if your throat chakra is blocked, but some signs include dental pain, frequent headaches, TMJ, sore throats, frequent interrupting during conversations and a lack of focus on the topic being discussed, lying, shyness, gossiping, manipulation, low self-esteem, and compulsive eating. Those people who have a healthy fifth chakra are often leading fulfilling and distinctive lives. You’ll find that these people are in tune with their thoughts and feelings and know a great deal about their truth. They also make great listeners, writers, and speakers. It’s inspiring to be in their company and they can be influential as well as wonderfully creative. 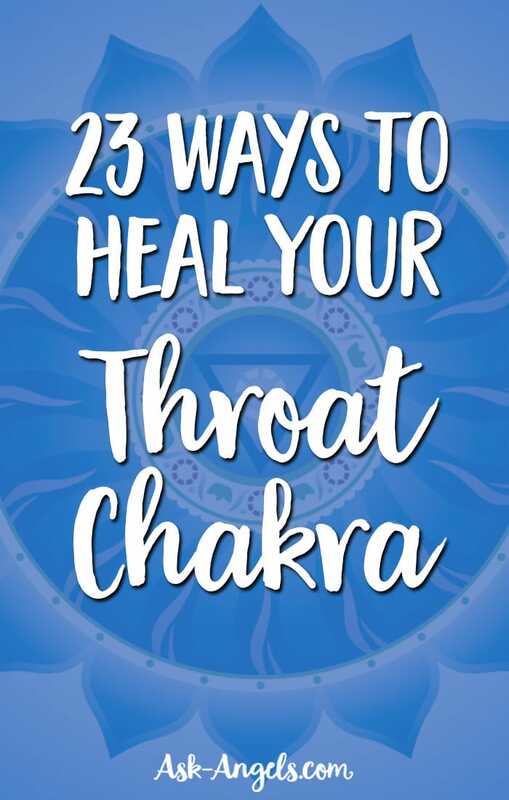 Here are 25 ways to bring throat chakra healing into your life now. When you come across something in life that doesn’t sit well with you, make an effort to speak up or speak out. Maybe you write a letter to the editor, make a suggestion to a manager, or take a positive action to create change. Keep a journal and regularly review it. Try reading recent passages out loud. Listen to music that makes you want to dance and sing. Both activities will help all your chakras to flow freely, but especially your throat chakra. Go big and try your hand at public speaking. Trying humming, chanting, or singing. Find a spot and a time where you can have some solitude and really give yourself over to this spiritual practice. Don’t worry about how you think you should sound, just focus on your real and true sound and making it as strong as you can. Regularly do shoulder and neck rotations. Consider yoga asanas that directly impact the throat chakra – like Lion, Fish, and Plough. Blue gems or jewels in a necklace will have a positive effect on clearing blockages in your throat chakra. Take time to write down your goals and dreams. Even if you’re just day dreaming. Don’t censor yourself – these can be incredibly powerful lists. Visualize your throat chakra as a wheel that is spinning smoothly, giving and receiving energy in a healthy way. You can also visualize the color blue in your throat area. The color associated with this chakra is blue and the hue will have a positive impact on cleansing and healing. Find someone to listen to. Give yourself over to fully listening to them for five minutes. Do this without making comments – including non-verbal gestures. Then switch and have them do the same for you. Talk about whatever is on your mind. When both of you are finished, neither should comment on what the other said. Just thank each other for sharing. Stay hydrated. Regularly drinking plenty of clean, purified water is essential for throat chakra health, and really your health in general. Consider investing in a water purification system or filter if you haven't already. Develop a practice of regular chakra cleansing. Each of the seven major chakras impacts each other. If one is blocked, they may all be struggling. Likewise, when one is open and strong, it will support the others. Doing a daily meditation to cleanse all seven chakras will benefit the throat chakra. A massage can have so many benefits, one of which is getting stuck energy flowing again. Become more aware of the words you use. Try to speak with compassion and love. If you find yourself talking about negative things or you tend to be critical, try to consciously change that. Get in the flow of creation by creating something new. This could be a DIY project, a new habit or hobby, or even taking the time to creatively write, paint or draw. Use essential oils like lavender, sandalwood, or neroli. Place a drop under your nose to breathe in and dab some around your neck and ears. Use throat chakra stones or quartz crystals to raise the vibration of the chakra. Place the stones on the throat or area where you perceive an imbalance, and practice visualization or mindfulness meditation for 15-20 minutes. Exercise your mouth and voice. Try laughing yoga, big satisfying yawns, screaming at the top of your voice (great to do with kids! ), kiss, roll your tongue, whistle… you name it. Try learning a musical instrument. Not only is it fun and cathartic, but using your voice in this way is a fast method to get energy flowing to your throat chakra. Start keeping a dream journal. When you aren’t doing a great job of expressing yourself during your waking hours, your spirit sometimes tries to express itself in dreams. Writing them down helps you to pay attention to the messages and hopefully gain some clarity about how to speak your truth and move in the direction of your Self. Unplug the phone (or, don’t recharge it!) and step away from texting. The most common ways we communicate today often serve as nothing more than static noise for our spirits. Emailing and messaging just keep our mind busy but do little for our Selves. Take a break, try 30 minutes. Then an hour, then half a day. Try silence. Though it seems counter intuitive to stop talking in order to relieve a blocked throat chakra, the time you spend in silence will likely bring you a great deal of calm and clarity. If you can, spend a half a day or a whole day in silence, opening yourself to the messages that your angels are sending. Try deep belly breathing. This one is a remedy for so many things in life, but for sure it brings a sense of peace and relaxation and gets energy flowing again. A regular deep breathing practice is a good time to check in with each of your chakras and intuitively gage how they fluctuate from day to day. Ask the angels for help! Archangel Gabriel specifically is wonderful for helping you to clear your channels of self expression so you can speak Divine love through your clear and open throat chakra. As you work on any of these tips or practices, always keep your intention at the front of your mind. 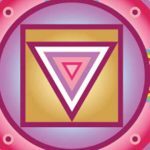 Not only is regularly being aware of your intentions a positive force for a blocked throat chakra, it’s also an easy way to make these practices more powerful. Being mindful of why you’re doing what you’re doing will give you more a strong connection to your angels and to the divine. Self Healing, You Can Heal Yourself!